Angela Eastlund leading a meeting at the Chicago Jobs Council. 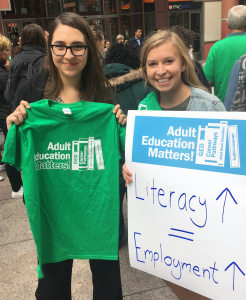 Applied Community and Economic Development Fellow Angela Eastlund is working for better employment as a pathway out of poverty through her professional practice with the Chicago Jobs Council. Eastlund received her bachelor’s degree from Creighton University in Omaha, Nebraska, in 2016. She majored in medical anthropology with minors in public health and Spanish. While browsing anthropology graduate programs online, she found the Stevenson Center, where she is pursuing her master’s in cultural anthropology with an interdisciplinary sequence in Applied Community and Economic Development (ACED). ACED Fellows must have at least one year of full-time experience in community development or social services or the equivalent (1,700 hours)—as either a paid professional or a volunteer—prior to starting classes. After her studies at Creighton, Eastlund served for a year with a new AmeriCorps program, Let’s Move Outside – Omaha. Eastlund’s involvement with the Stevenson Center has been rewarding. The classes she took in the first year were stimulating and worthwhile. Angela Eastlund (right) and coworker at a demonstration for adult education in downtown Chicago. After an intense year of graduate study, ACED Fellows complete 11 months of professional practice. Eastlund is with the Chicago Jobs Council, a nonprofit organization with the vision “that all people—regardless of where they started or where they’ve been—can access employment as a pathway out of poverty.” The jobs council has two complementary facets: capacity building for frontline workforce development professionals and policy advocacy. Eastlund is part of the policy advocacy team. “Our policy advocacy focuses on issues that pertain to barriers of employment, such as transportation, education, housing, food insecurity, etc.,” Eastlund said. For example, the team recently advocated for better Supplemental Nutrition Assistance Program Employment and Training projects throughout the state. Eastlund’s role also includes communication for the council. “In a typical day I might draft and edit a public comment in response to harmful proposed federal rule changes, post a new report on employment in Chicago on social media, attend an advocacy strategy meeting with partner organizations, or organize an email to our member organizations on current policy advocacy issues and upcoming events,” she said. Her experience with the Chicago Jobs Council has been eye-opening, educational, and challenging—all in the best ways possible. Prior to coming to the Stevenson Center, Eastlund had little exposure to policy advocacy work, and now she has learned about the most effective strategies, tools, and resources. Megan Birk is the Stevenson Center’s public relations intern.